🔗What is a compressor? Why do we need compression? 🔗How Does A Compressor Differ From The Pump? 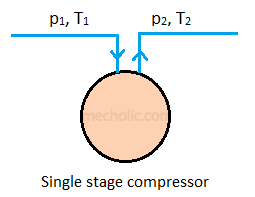 What is single stage compressor? What are the drawbacks/ limitation of single stage compressor? When the compressor has only one cylinder, and it compresses the fluid in that cylinder then delivered at high pressure; it is called single stage compressor. The following list describes the drawbacks of single stage compressor used for producing very high-pressure fluid. To attain high pressure ratio the size of cylinder will be too large. Strong and heavy working parts increases the balancing problem and cause high torque fluctuation. The temperature of fluid increases due to compression. In a single stage process, there is no efficient way to dissipate that heat from fluid. The increasing temperature eventually damages the cylinder head. Sometimes it burns the lubricating oil. The higher temperature increases the specific volume of fluid and thus increase the compression work required. The friction loss in single stage compression is very high. The higher pressure ratio increases the leakage loss. In air compression, larger expansion of clearance air decreases the effective suction volume. It decreases volumetric efficiency. The running cost of such compressor is high. What is compound/ multi-stage compressor? When the more than one compressor/ cylinder connected in series with intercooler between them to deliver the fluid at high pressure, then the compressor is called multi-stage compressor. Here the pressure of fluid increases in more than one stages. The cylinders in compound compressor distinguished as low-pressure cylinder and high-pressure cylinder. This arrangement provides the means for cooling of fluid between stages, and thus compression work is reduced. This arrangement is adopted for very high compression ratio to avoid difficulties occurred in single stage compressor. 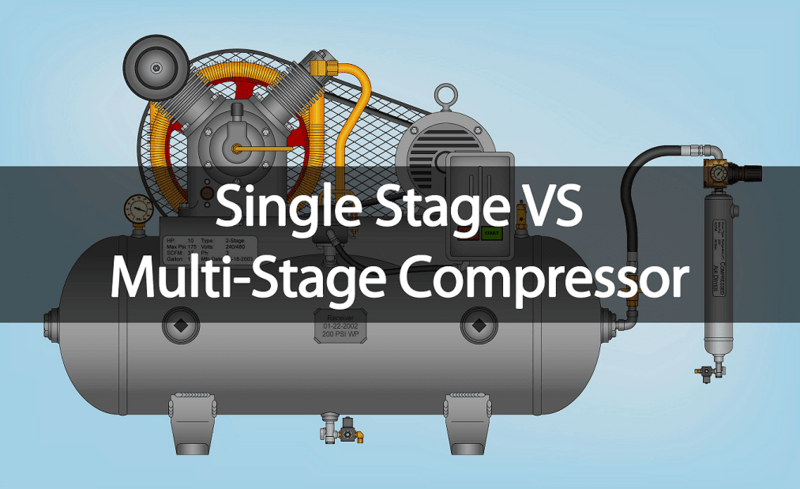 🔗Why multi-stage compressor more efficient than a single-stage compressor? The fluid can be compressed to very high pressure. The intercooler is more efficient than the cylinder wall cooling in a single stage compressor. For same pressure, the work done per unit weight of fluid is low in a compound compressor than that of single stage compression. Reduce the cost of the compression process. For a given pressure ratio, the multistage arrangement improves volumetric efficiency. The lower temperature range in each stage of compression improves the lubrication. Pressure ratio per each stage is lowered and it reduces the leakage loss. The size cylinders of multi-stage compressor can be adjusted to suit the compression requirement. It gives the uniform torque and better mechanical balance, hence reduce the size of flywheel required. Design flexibility - lighter low-pressure cylinder and smaller high-pressure cylinder (as the pressure ratio reduced in each stage).